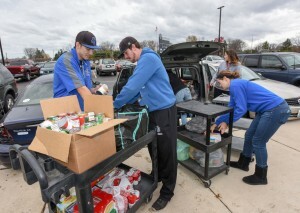 Volunteers from the AU Student-Athlete Advisory Committee gather goods collected during the Cans Across the Conference food drive and prepare to deliver them to the local food pantry. As service projects become an increasingly visible part of student life, AU students are building their lives around character, scholarship and a desire to make a difference. For senior track and cross country runner Sherry Maschmeyer, this is certainly true. As president of the AU Student-Athlete Advisory Committee (SAAC), an on-campus organization that helps bring service-learning opportunities to the Spartan community, Maschmeyer says it is important for student-athletes to give back. “Taking time to serve others shows gratitude and creates a feeling of unity between our athletes and the community,” she said. The mission of the national SAAC is to enhance the total student-athlete experience by promoting opportunity, protecting student-athlete welfare and fostering a positive student-athlete image. The AU committee is the voice for Spartan athletes on a variety of topics, but also focuses much of its energy on making a difference across campus and beyond. The group organizes several events each year, giving back in a big way. Through activities such as Cans Across the Conference and Project Linus, SAAC is able to collect nonperishable goods for the local food pantry and provide a sense of security, warmth and comfort to children in need through the gifts of handmade blankets. 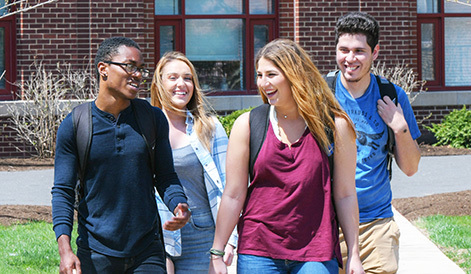 “As professionals in higher education, we are empowered to assist the educational and social development of young adults,” said athletic director Jim Hamad. “Through service-learning opportunities, we positively impact communities and help create well-rounded student-athletes.